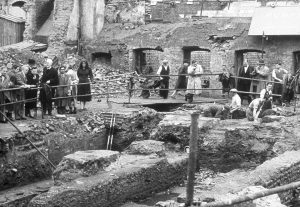 In the second century A.D. a temple of Mithras stood on the bank of the Walbrook, a stream running across London from the City Wall near Moorfields to the Thames. In this temple Roman soldiers sought valour and virility in shower-baths of hot blood from slaughtered bulls. After the recall of the legions to Rome in 410 A.D. the building became a quarry; the locals left only the foundations. These were discovered when Bucklersbury House was built in 1953-1957, and they are preserved to this day. However, there were no foundations of the Christian church which stood on the site and was a going concern in 1090 A.D. when it was given to the monastery of St. John by Eudo, Dapifer (cupbearer) to Henry I. It was Saxon, not Norman, and must have been built on the Mithraic foundations to hallow a heathen site. This could have been as early as 700 A.D., or as late as 980. By 1428 this church and its graveyard were too small for the parish, and licences were obtained to build a larger church on higher ground some twenty meters to the east, the ground having risen about six meters; and Walbrook, no longer a stream, was now a street. The land, 208½ feet by 66 feet, was given by Robert Chicheley, a member of The Worshipful Company of Grocers. The building, of flint and rubble with stone dressings, had a tower at the west and a cloister on the north. It was one of a hundred churches in the square mile of the City of London. In 1941 much of this area was devastated by an air raid. 160 people died. The church dome was damaged and most of the buildings around the church were badly damaged or destroyed. The houses were not so solid: most of them were built on timber frames, infilled with lath and plaster work, and as the population increased roofs were raised and back yards built over. In 1662 the diarist, Samuel Pepys, added a storey to his house elsewhere in the City, taking light from his neighbour. This crowding allowed the rapid spread both of infection and of fire. At the east end of the church was Bearbidder Lane, the source of the Great Plague of 1665. The only doctor who remained with his patients was Nathaniel Hodges, to whom there is a plaque in the present Church. 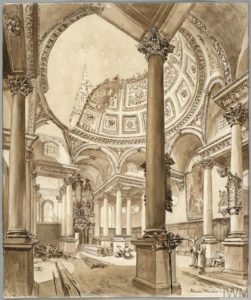 For an in-depth description of the history of St Stephen Walbrook, click on St Stephen Walbrook on top of the index on the right.